Only enterprise customers with an Adobe Open Options (AOO) volume license of Photoshop Elements or Adobe Premiere Elements can perform the procedures of this article. The following procedures enable you to you create Windows (MSI file) or Mac OS (PKG file) packages. You can then use any third-party deployment tool that supports the deployment of native installers (for example, Microsoft SCCM, Apple ARD, or JAMF Casper Suite) to deploy the packages to client computers. 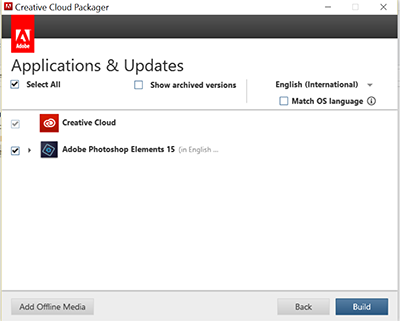 It's necessary to use the most recent version of Creative Cloud Packager to create Photoshop Elements or Premiere Elements deployment packages. 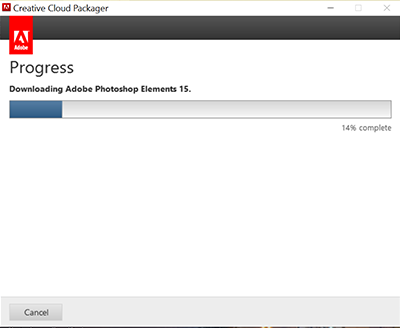 Run Creative Cloud Packager downloaded in step 1. 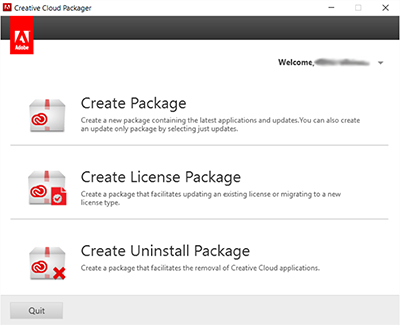 Run Creative Cloud Packager as an Administrator on the computer you are building packages on. Sign in with your Adobe ID and password. To start the package creation process, click Create Package. To modify an existing package, click Edit Package and then browse to an existing .ccp file. The .ccp file is located in the same location as the existing package. Enter the location to which you want to save the package you create. You can click to locate the destination folder, or enter the absolute path. (Windows only) Choose 32-bit or 64-bit processor support. Make separate packages for 32-bit and 64-bit installations. A 32-bit package does not run on a 64-bit machine. Note: 32-bit/64-bit installation is applicable only for Elements 14 and earlier. Elements 15 supports 64-bit installations only. Choose Serial Number License for the application. 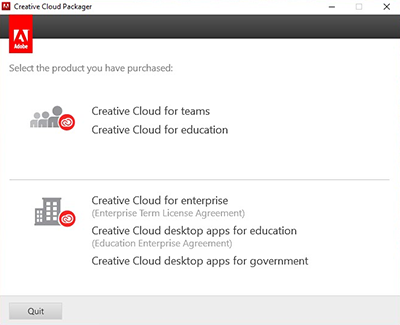 Note: The Creative Cloud Desktop Application check box is not applicable for Elements. You can deselect this option. To review or change the package configuration settings, click Change, and modify settings in the Advanced Configurations screen. For more information, see Creating Packages. On the Enterprise Customers Only screen, enter a Volume Serial Number. On the Applications & Updates screen, select the products or updates that you want to include in the package. Use media provided by Adobe or downloaded from the Adobe website to ensure that it is not corrupt and does not contain malicious code. Click Done to return to the Applications & Updates screen. 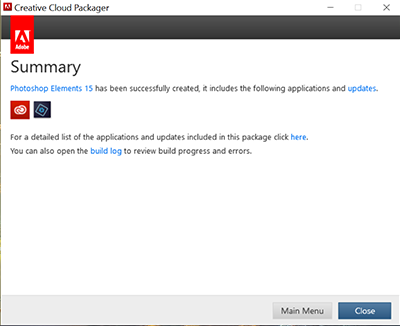 Creative Cloud Packager downloads the products and/or updates that have not been downloaded already to your machine. It then builds the package. The progress is displayed on the Download Progress and Build Progress screens. When you create a package, Creative Cloud Packager creates a configuration file for the package with the name <package_name>.ccp. This file is located in the folder that you specify for the package. This configuration file is for internal use only; do not modify or delete this file. 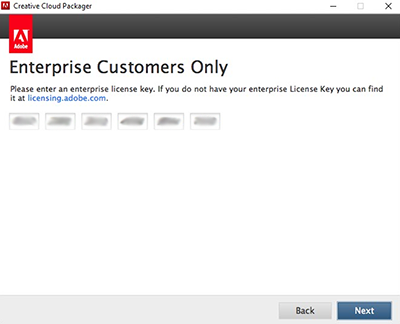 To exit Creative Cloud Packager, click Close.